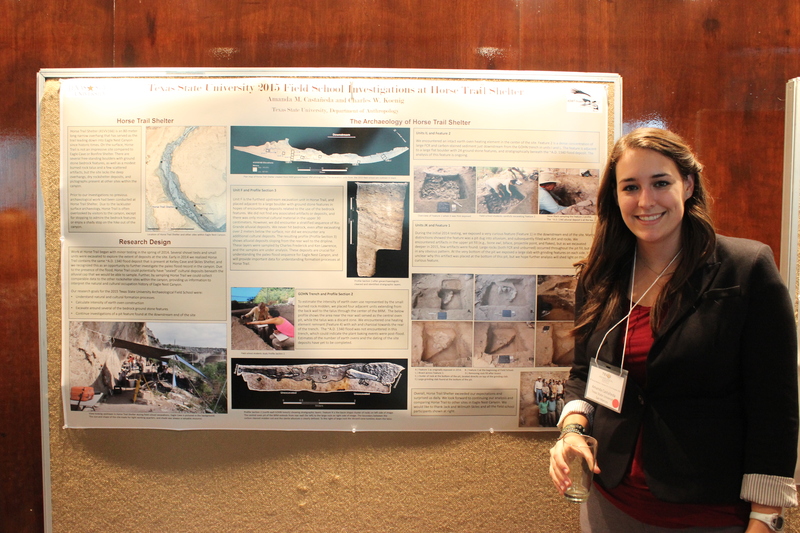 Amanda stands next to her poster at TAS. Location of Horse Trail Shelter and other sites within Eagle Nest Canyon. Horse Trail Shelter (41VV166) is an 80-meter long narrow overhang that has served as the trail leading down into Eagle Nest Canyon since historic times. On the surface, Horse Trail is not an impressive site compared to Eagle Cave or Bonfire Shelter. There are several free-standing boulders with ground stone bedrock features, as well as a modest burned rock talus and a few scattered artifacts, but the site lacks the deep overhangs, dry rockshelter deposits, and pictographs present at other sites within the canyon. Prior to our investigations no previous archaeological work had been conducted at Horse Trail Shelter. Due to the lackluster surface archaeology, Horse Trail is often overlooked by visitors to the canyon, except for stopping to admire the bedrock features or enjoy a shady stop on the hike out of the canyon. Work at Horse Trail began with minor testing in the spring of 2014. 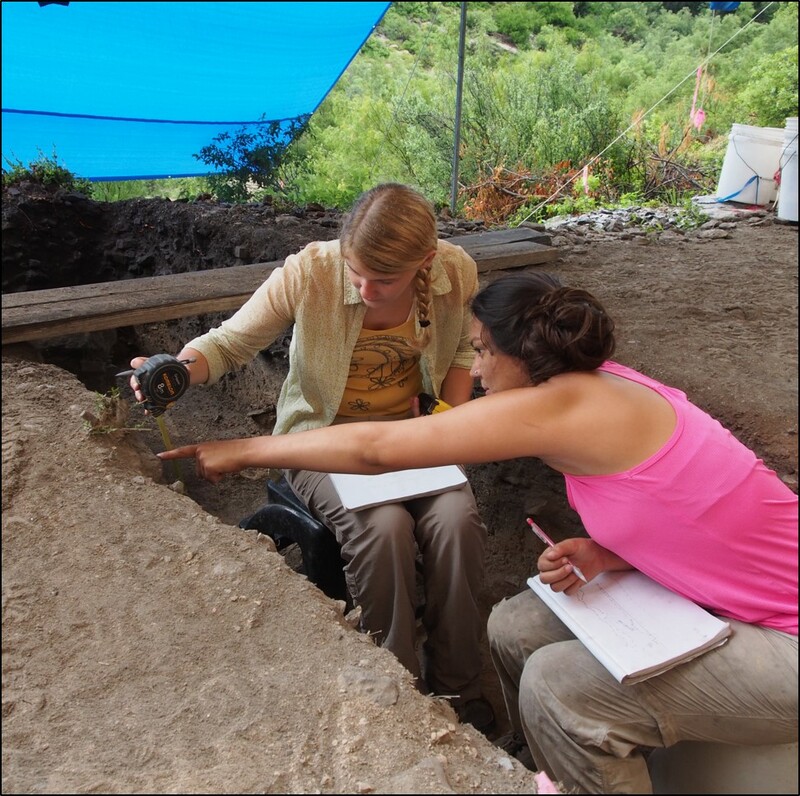 Several shovel tests and small units were excavated to explore the extent of deposits at the site. Early in 2014 we realized Horse Trail contains the same ~A.D. 1340 flood deposit that is present at Kelley Cave and Skiles Shelter, and we recognized this as an opportunity to further investigate the paleo flood record in the canyon. Due to the presence of the flood, Horse Trail could potentially have “sealed” cultural deposits beneath the alluvial cap that we would be able to sample. 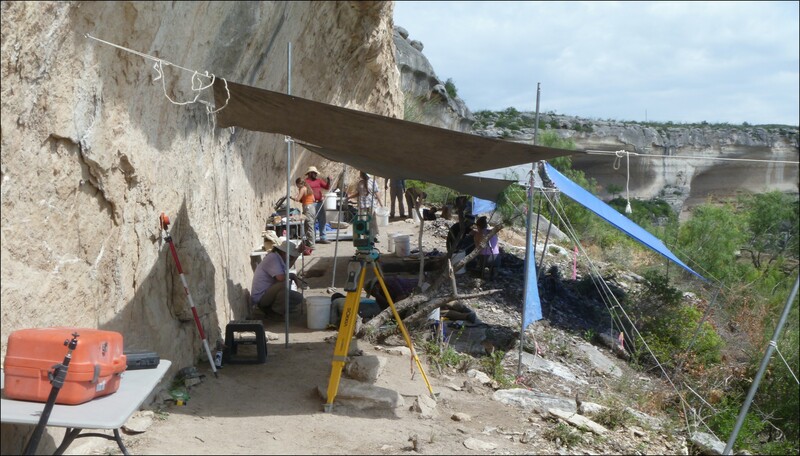 Further, by sampling Horse Trail we could collect comparable data to the other rockshelter sites within the canyon, providing us information to interpret the natural and cultural occupation history of Eagle Nest Canyon. View looking upstream in Horse Trail Shelter during field school excavations. Eagle Cave is pictured in the background. The size and shape of the site made for tight working quarters, and shade was always a valuable resource. 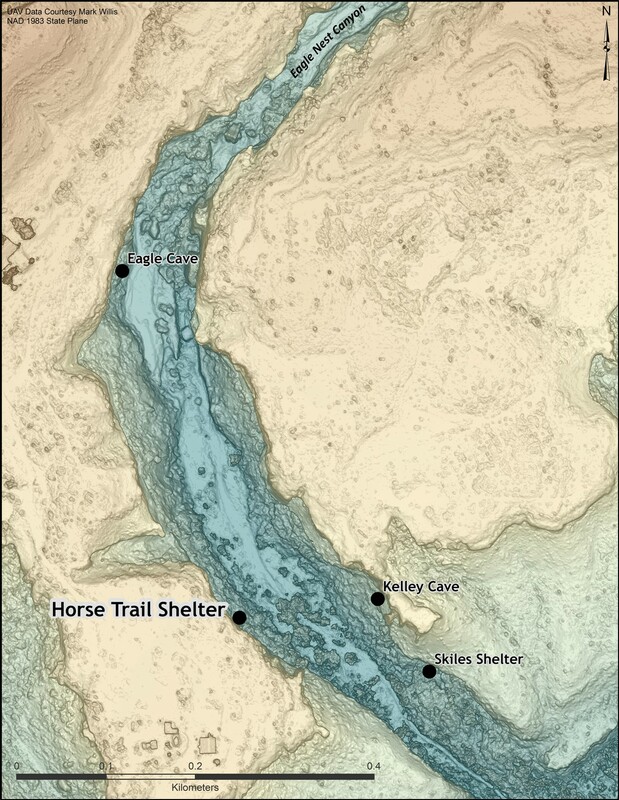 Plan map of Horse Trail Shelter created from 3000 ground-based SfM photographs. The excavation units from the 2015 field school are outlined in black. Profile Section 3 after geoarchaeologists cleaned and identified stratigraphic layers. Unit F is the furthest upstream excavation unit in Horse Trail, and placed adjacent to a large boulder with ground stone features in hopes of encountering deposits related to the use of the bedrock features. We did not find any associated artifacts or deposits, and there was only minimal cultural material in the upper 30 centimeters. However, we did encounter a stratified sequence of Rio Grande alluvial deposits. We never hit bedrock, even after excavating over 2 meters below the surface, nor did we encounter any additional cultural deposits. The resulting profile (Profile Section 3) shows alluvial deposits sloping from the rear wall to the dripline. These layers were sampled by Charles Frederick and Ken Lawrence, and the samples are under analysis. These deposits are crucial for understanding the paleo flood sequence for Eagle Nest Canyon, and will provide important data for understanding formation processes at Horse Trail. 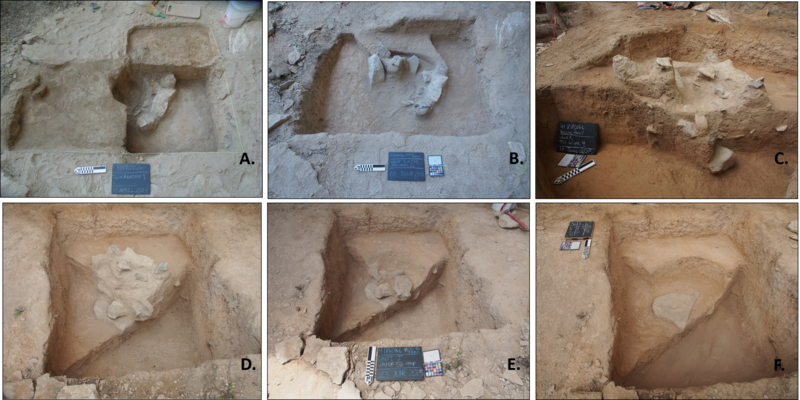 To estimate the intensity of earth oven use represented by the small burned rock midden, we placed four adjacent units extending from the back wall to the talus through the center of the BRM. The below profile shows the area near the rear wall served as the central oven pit, while the talus was a discard zone. We encountered one heating element remnant (Feature 4) with ash and charcoal towards the rear of the trench. The ~A.D. 1340 flood was not encountered in this trench, which could indicate the plant baking events were post-flood. Estimates of the number of earth ovens and the dating of the site deposits have yet to be completed. Profile Section 2 (north wall GOHN trench) showing stratigraphic layers. Feature 4 is the basin shape cluster of rocks on left side of image. The central oven pit of the BRM extends from rear wall (far left) to the large rock on right side of image. The boundary between the carbon-stained midden soil and the sterile alluvium is clearly defined. To the right of large rock the discard zone tumbles down the talus. We encountered an intact earth oven heating element in the center of the site. 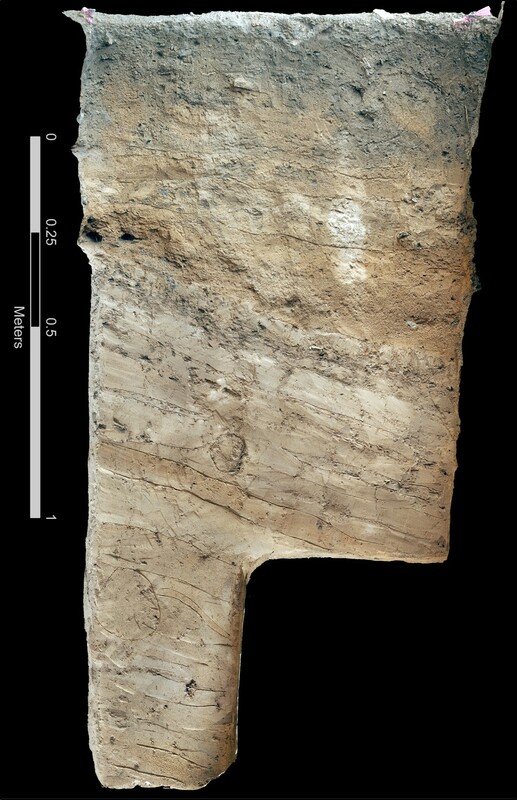 Feature 2 is a dense concentration of large FCR and carbon-stained sediment just downstream from the GOHN trench in units I and L. The feature is adjacent to a large flat boulder with 24 ground stone features, and stratigraphically beneath the ~A.D. 1340 flood deposit. The analysis of this feature is ongoing. (Left) Overview of Feature 2 when it was first exposed; (center) Field school students carefully excavating Feature 2; (right) Steve Black sampling the Feature 2 profile. The ~A.D. 1340 alluvial deposit is at the top. During the initial 2014 testing, we exposed a very curious feature (Feature 1) in the downstream end of the site. Matrix distinctions showed the feature was a pit dug into alluvium, and subsequently filled with dirt and rocks. We encountered artifacts in the upper pit fill (e.g., bone awl, biface, projectile point, and flakes), but as we excavated deeper in 2015, few artifacts were found. Large rocks (both FCR and unburned) occurred throughout the pit fill, but not in any obvious pattern. At the very bottom of the pit we exposed a large slab with grinding features on each side. It is unclear why this artifact was placed at the bottom of this pit, but we hope further analysis will shed light on this curious feature. A.) Feature 1 as originally exposed in 2014. B.) Feature 1 at the beginning of Field School. C.) Bisect across Feature 1. D.) Removing rock fill after bisect. E.) Cluster of rock at the bottom of the pit, located directly on top of the grinding slab. F.) Large grinding slab found at the bottom of the pit. Overall, Horse Trail Shelter exceeded our expectations and surprised us daily. We look forward to continuing our analysis and comparing Horse Trail to other sites in Eagle Nest Canyon. 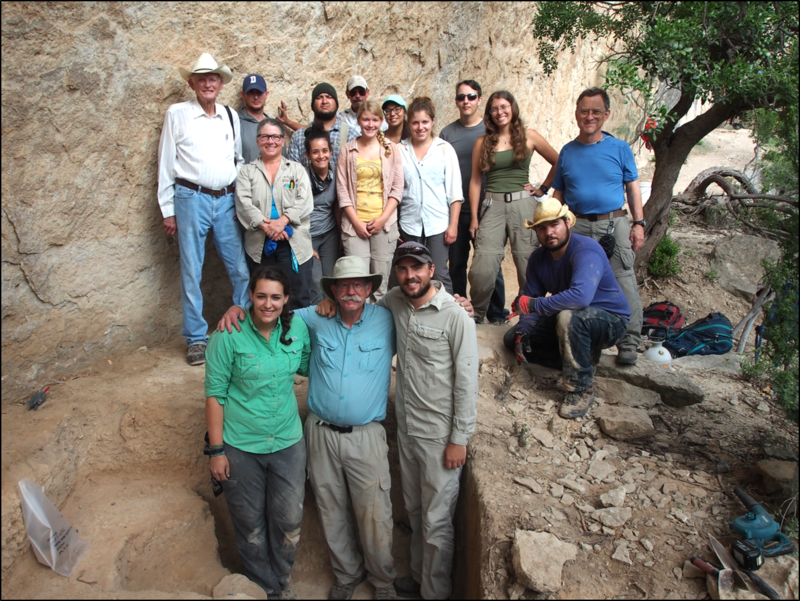 We would like to thank Jack and Wilmuth Skiles and all the field school participants shown at right. This entry was posted in 2015 TAS Poster Symposium. Bookmark the permalink. Cannot wait for next installment in this series of write-ups, I find this among the most interesting! Amanda and Charles. Practical post ! I Appreciate the specifics ! Does anyone know if my company can find a fillable a form copy to work with ?